Today we went and gathered some persimmons off of our many persimmon trees on the property. 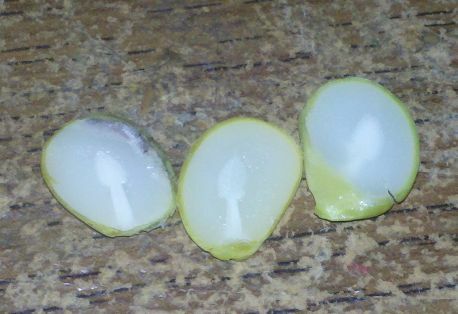 As you may or may not have heard, you can "predict" the upcoming weather by looking at the center of a persimmon kernel. That is what we did today. You just remove the kernel from the center of the persimmon and slice it lengthwise and look at the white part inside. It will look like either a knife, a spoon, or a fork. Knife: If the shape inside the kernel is a knife, it is believed to mean the winter will be cutting cold. So cold the wind feels like its cutting right through you like a knife. Spoon: When the shape inside the kernel looks like a spoon it is said to mean it will be a heavy winter. The spoon represents lots of shoveling. Fork: The appearance of a fork shape within the kernel is believed to mean that winter will be easy with only a light dusty of snow. As you can see, we cut three different persimmons and they all had a "spoon" inside. Our winters are generally very mild here and we rarely get snow so I'm excited about this "prediction". I'll let you know if it rings true or not. UPDATE: Winter of 2013-2014 was dead on! Have you ever done this? If so, was it right or wrong? Hankering for some dried persimmons, you can get some here. Interesting. Where do you live? I have heard about the abundance of acorns meaning a bad winter and thicker coats on the horses. I have never heard about persimmons. We live in SE Oklahoma. If you have persimmons where you live, I'd love for you to try it and let me know what they predict for your area. So glad you stopped by. I love hearing from fellow Okies! Have you cut a persimmon kernel this year to see if it gives the same prediction for your part of Oklahoma? 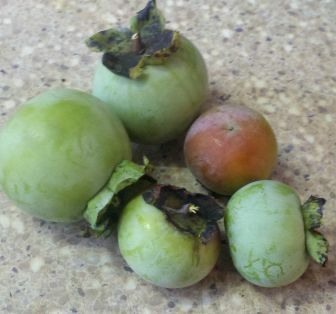 I haven't done it this year, we don't have persimmon trees on our property, but know where some are in the 'backwoods'...need to go get a few and check 'em out! Awesome. Would love to hear what the persimmons predict! I live in NE Oklahoma and we always use the persimmon seeds. I can only remember a couple times in 30 years they were wrong. The blizzard we got a couple years ago was also predicted by the spoons in the seeds. I am looking forward to more of a winter after the last 2 we have had! Need to do this for Chicago - we could use some snow this year! Thanks for posting this! I'm just getting ready to plant two persimmon trees in Northern Indiana and I have been obsessing over winter weather predictions as to the timing of their planting. Maybe I've just been tuning into the fact that persimmons themselves are associated with weather prediction. What a great fact to know! That's very interesting. We never get snow here! Mary, I love linking up with you and appreciate you hosting it! I done this last winter 2014/15 and all had spoons inside. I live in Tennessee so we had 200 percent of our total snowfall. Do I believe in this.? Well last winter was the first time I heard about this. So am more into the science about weather but I do think God put signs for up coming winters for man and and animals. Going to try it again this year and see what happens. Even the weather men don't get it right every time. So I will try this for 5 years and keep a track record on this. Very interesting to say the least.